In this chapter of the Berlin Contemporary Architecture Guide, we are heading east, walking from Unter den Linden, through Museum Island, to Alexanderplatz. In this chapter of the Berlin Contemporary Architecture Guide, we are heading east. We cross the former Wall line and walk towards Alexanderplatz. 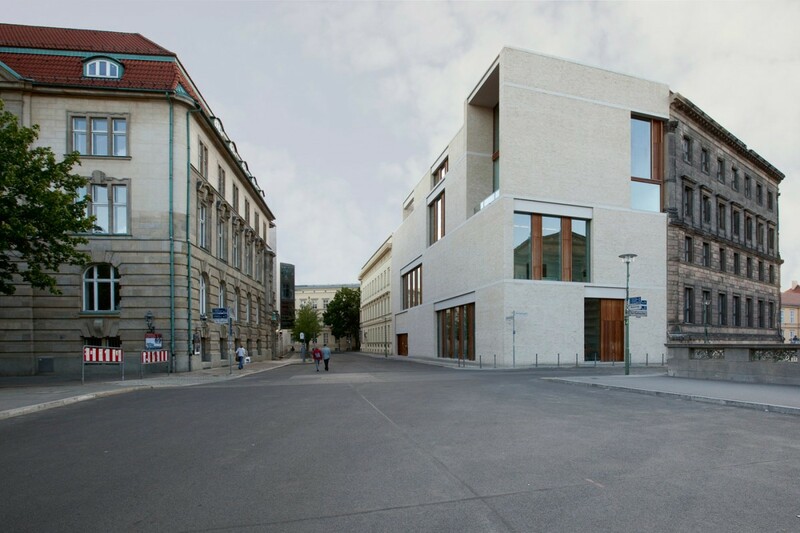 On the way, we’ll check some buildings around Unter den Linden, one of the city’s principal axes: Frank Gehry’s Pierre Boulez Saal, the German Historical Museum Extension Hall by I.M. Pei, and a gallery building by David Chipperfield. 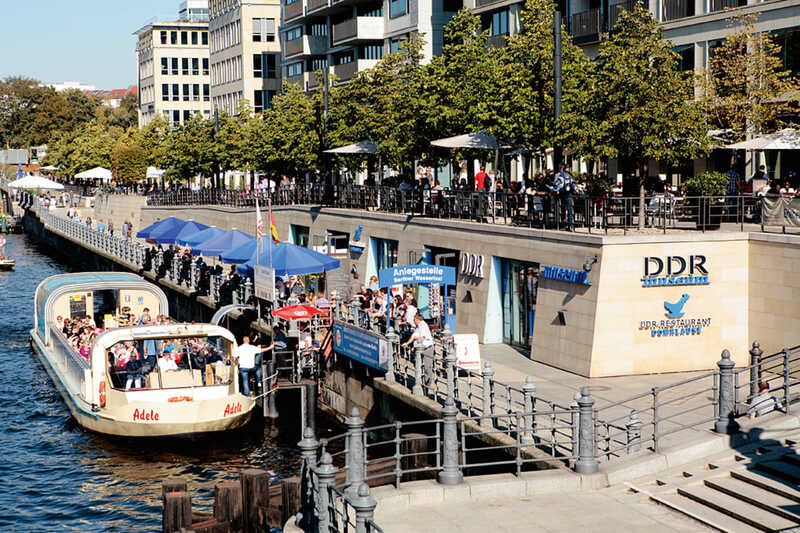 Next, we hop on an island in the middle of the River Spree. Called Museum Island, it was where Berlin was born over 800 years ago. Today it houses several museums, as well as many construction sites. 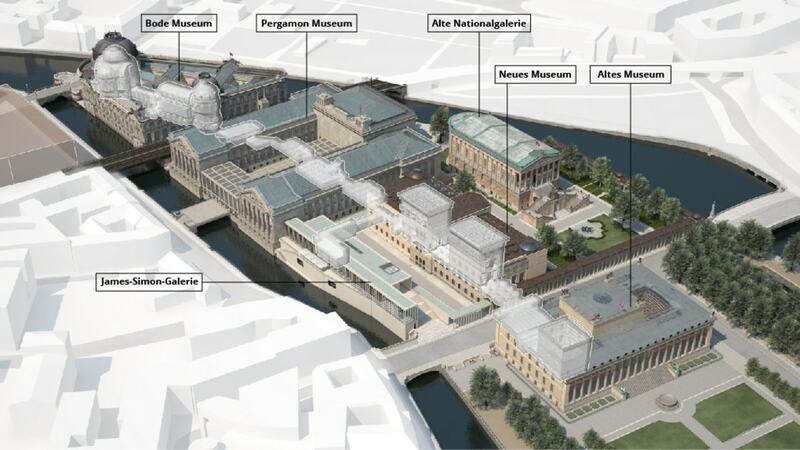 The recently renovated Neues Museum, by David Chipperfield, will be the central attraction in our tour. 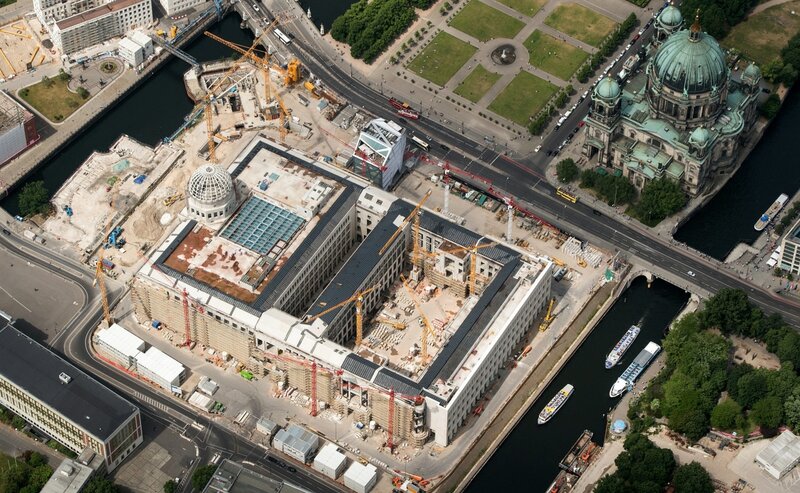 But the most notorious location is the currently largest construction site in Berlin, where the future Berlin Palace will stand. Jumping across the Spree once more, we are again on the mainland. Our last building, almost on Alexanderplatz: the TV Tower, or Fernsehturm. It stands 368-meters tall and is the symbol of the city. Go up to check the view, then continue on to explore former East Berlin, my favorite side of town. Pierre Boulez was a French composer, conductor, writer and organizer of institutions. He was a prominent figure of the post-war classical music world, and coined the idea of the a Salle Modulable. It is a 360-degree modular space in which a wide range of spatial correlations between musicians and the public would be possible by rearranging its tiers, thus blurring the borders between both communities. 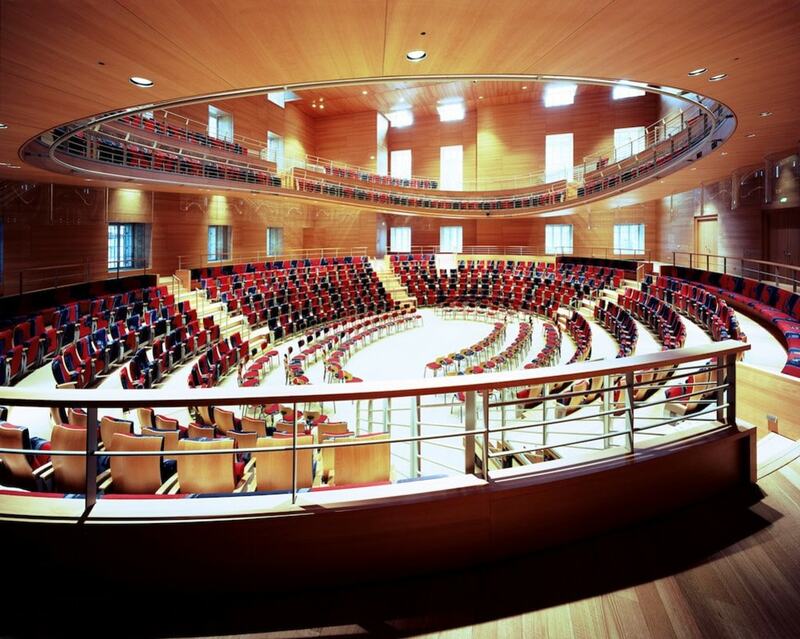 Frank Gehry took this idea to heart in the design of the Pierre Boulez Saal. 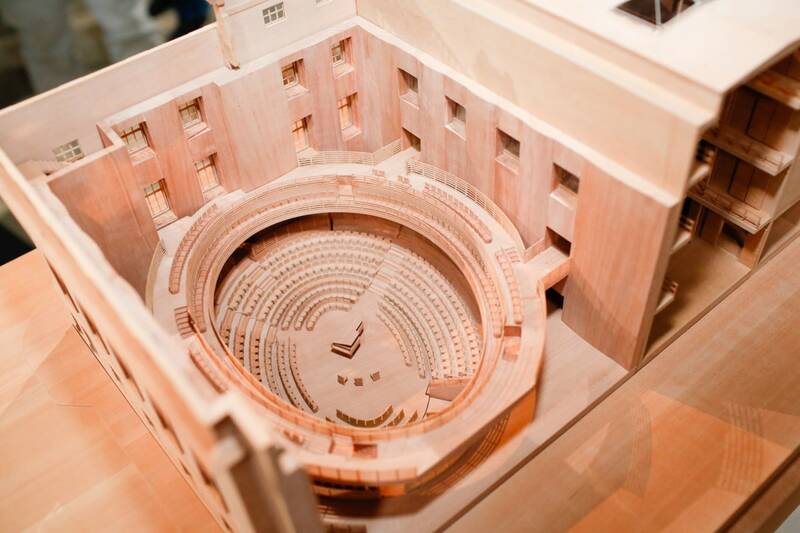 It is a 638-seat hall, placed inside a historic building in the center of Berlin. Inside its tall rectangular room, he arranged the seats within a series of overlapping, non-concentric ovals. The result is a dynamic space, where every spectator is less than 50 meters away from the music. It feels intimate. The building is the home of the Barenboim-Said Akademie . It is a conservatory meant to bring together musicians from different regions in the Middle East and offer them a stage to take their first step in the spotlight. The Pierre Boulez Saal is located right next to Bebelplatz. It is a public square lined on one side by the Humboldt University Law School building and on the other, by the Berlin State Opera building. In the middle of it, almost invisible, is one of my favorite memorials in the city. 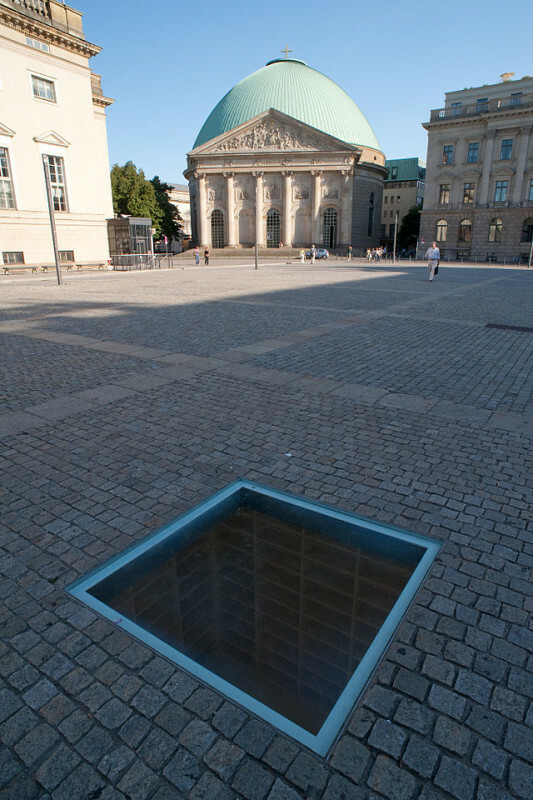 The Bebelplatz is known as the site of one of the infamous Nazi book burning ceremonies held in the evening of 10 May 1933 in many German university cities. They burned around 20,000 books, including works by Heinrich Mann, Erich Maria Remarque, Heinrich Heine, Karl Marx, Albert Einstein and many other authors. Today a memorial by Micha Ullman consisting of a glass plate set into the cobbles, giving a view of empty bookcases (large enough to hold the total of the 20,000 burnt books), commemorates the book burning. Furthermore, a line of Heinrich Heine from his play, Almansor (1821), is engraved on a plaque inset in the square: "Das war ein Vorspiel nur, dort wo man Bücher verbrennt, verbrennt man am Ende auch Menschen." (in English: "That was only a prelude; where they burn books, they will in the end also burn people"). From here, cross the Unter den Linden to check I.M. Pei’s Extension Hall to the German Historical Museum. In 1988, Aldo Rossi won a competition to design the building for the German Historical Museum in West Germany, next to the Reichstag. 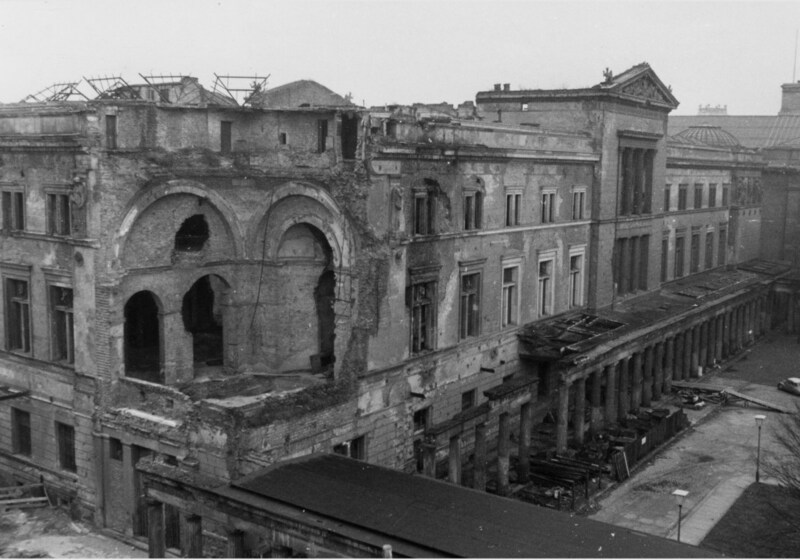 With the fall of the Wall in 1989, the government decided to abandon these plans and to consolidate the Museum’s collection in the Zeughaus. It is the oldest building in Unter den Linden and one of the most important Baroque buildings in Berlin. 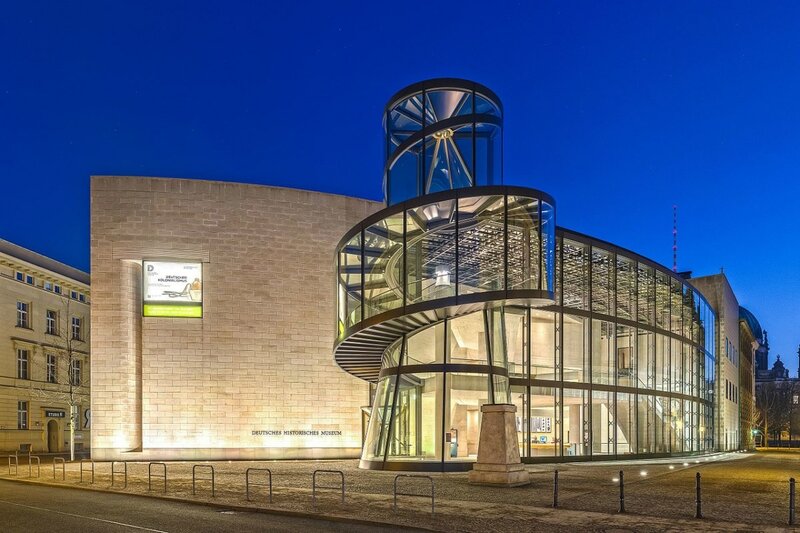 After completing the renovation of the Louvre, in Paris, and the National Gallery, in Washington, I. M. Pei landed the commission to design the extension to the German Historical Museum next to the Zeughaus. The new hall is divided into four stories and a large glass foyer, marked by a peculiar conical spiral staircase. Tucked away behind the Museum’s main entrance, it houses its temporary exhibitions. This building by David Chipperfield Architects fills a gap left by the destruction of the War. It is a prominent location, overlooking the Museum’s Island (and on the same street where Angela Merkel supposedly lives!). The architect chose to design a heavy stone building, made light by its large floor-to-ceiling windows. Inside, an art gallery with 5.5-meter tall spaces makes use of the city views as part of its art collection. 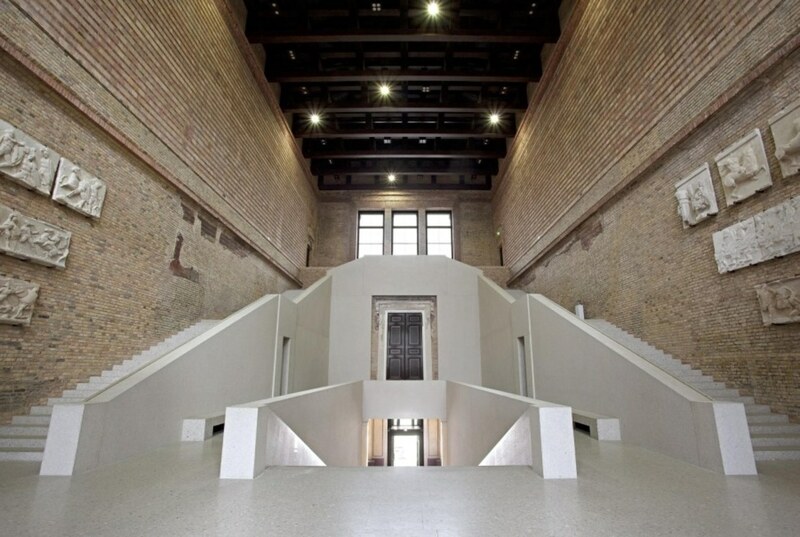 The Neues Museum was destroyed during the War but was recently renovated by David Chipperfield. 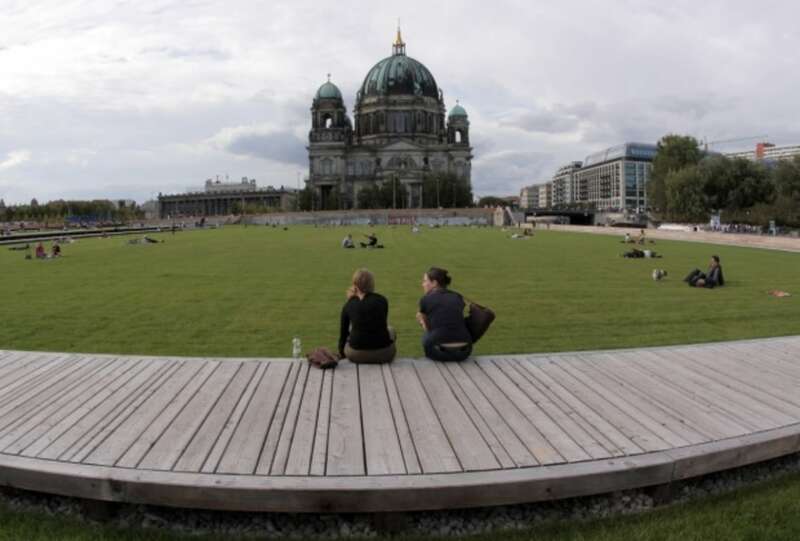 He is also in charge of the Museum Island Master Plan . It intends to add new buildings to complement the ensemble and to connect all buildings in a single complex. Also, all museums will be renovated to modern, visitor-oriented standards. The new unified entrance and reception hall, the James-Simon-Galerie, recently inaugurated. The Pergamon Museum is still all scaffolded, undergoing heavy construction work. But the Neues Museum is completed and running, and is our next stop. The Neues Museum was designed by Friedrich August Stüler and completed in 1855. It was characterized by its lavishly decorated galleries intended to house Egyptian and Pre-historic art. Each hall had a theme and was an attraction by itself. Air raids destroyed much of it between 1943 and 1945. It was left abandoned for much of the later decades. 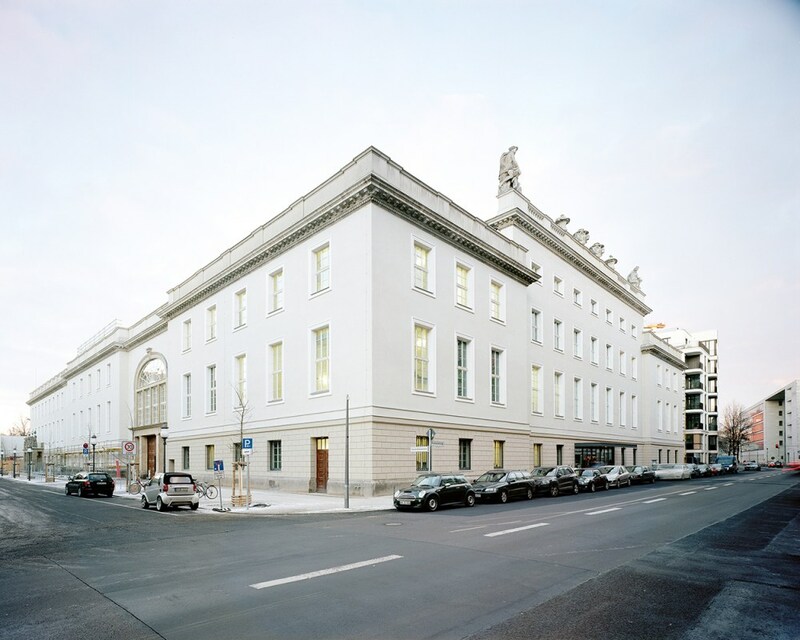 Finally in 2003, reunification efforts made possible the restoration work commanded by David Chipperfield in collaboration with restoration architect Julian Harrap. What opened six years later was a new museum in which the scars of the war were not erased, but incorporated. Chipperfield didn’t want to make the ruins of the old museum only a backdrop for a new architecture. But also, there was no desire to reconstruct an exact replica of what the War destroyed. What took place was an incorporation of the available building fabric with a series of contemporary elements. The latter reflects the lots without trying to imitate it. It is a special building in which you can spend hours marveling at how the architects dealt with each room, each column, or hole in the wall. Coming to Berlin since 2006, I caught a glimpse of the complicated story of this project. When I first visited the site, there was an entirely different building standing on it. 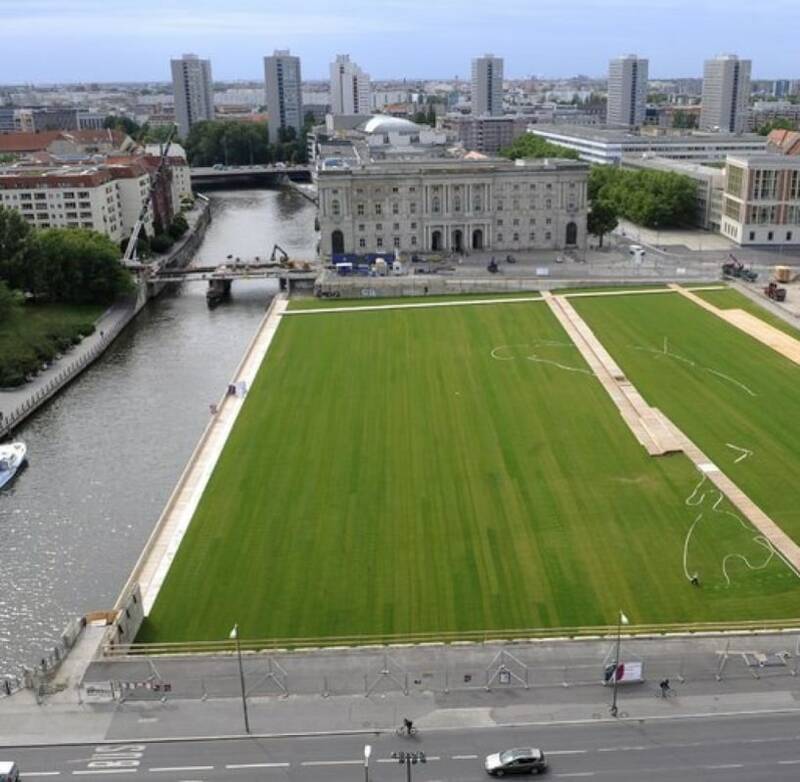 A few years later, in its place was a large grass field, a lovely park in the middle of Berlin. And now, the Palace. Again. Let me explain. At the end of the 17th century, architect Andreas Schulter took on the task to create the palace of the Prussian Kings, the Berlin Palace. 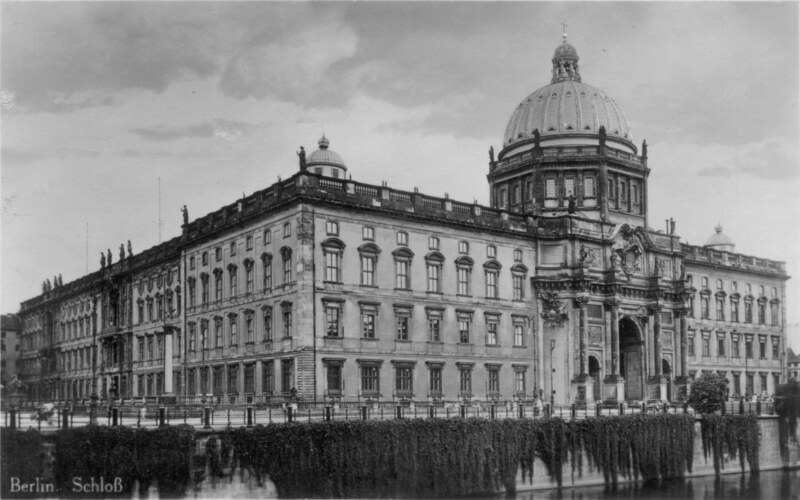 The large building, with its Baroque facade, large courtyards, and a dome, stood in the middle of the Museum Island, overlooking the Cathedral and the Lustgarten. 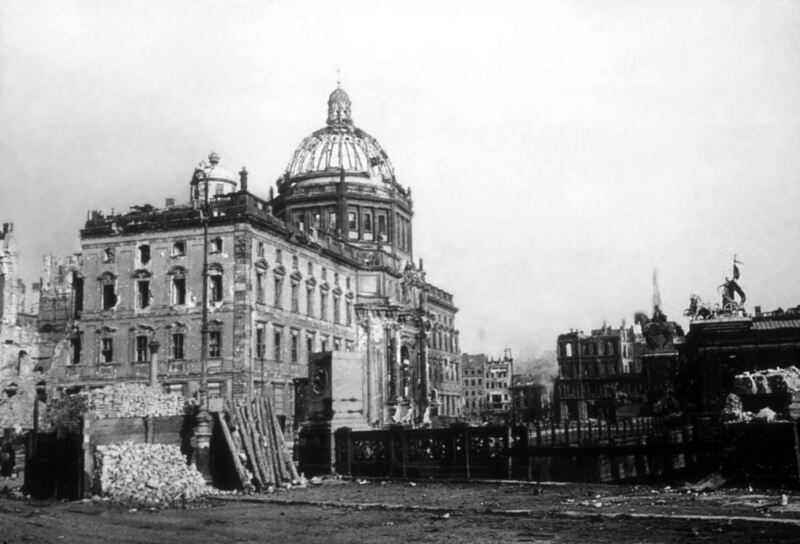 Like many things in Berlin, the War left the Palace in ruins. Although salvageable, they lied in the middle of East Germany. The communists had no desire to restore it and saw them as remains of a dictatorial past. In 1952, the German Democratic Republic (GDR) finally bulldozed it all. 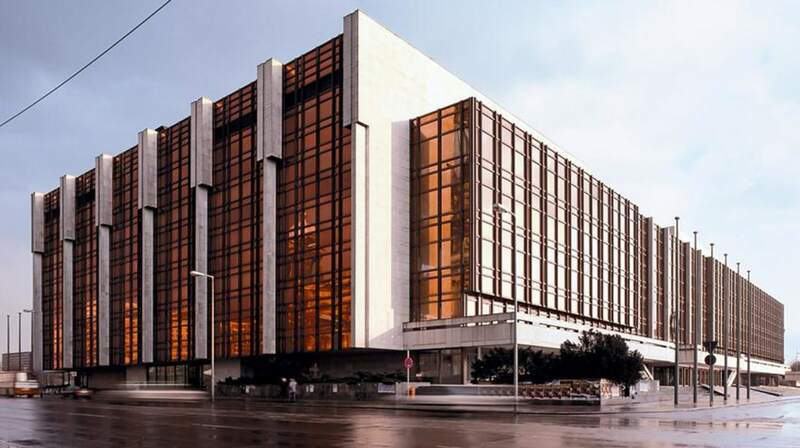 In its place, they erected a modern glass and bronze building to house the Socialist Party: the Palast der Republik . It became not only the house of the party but also a significant center in the life of GDR’s population. Cinemas, cafes, exhibition, events, brought the people to the heart of the party, quite literally. But reunification came to change everything once again. The Palast was closed due to the discovery of asbestos in its construction. Even after its cleaning, it remained closed except for the occasional event held in its empty shell. Many years of arguments and discussions and protest followed the announcement of a proposal to demolish it and rebuild the former Palace in its place. As you can see by what stands before you, the pro-Palace part of the debate won, back in 2002. Franco Stella got the commission after a competition, and the “new” building should be ready in 2018. Only one facade does not look anything like the old Palace; the rest is a faithful reproduction. Call it beautiful or call it crazy, the debate is still going on. The future building will house the Humboldt Forum . Galleries, event spaces, research institutes, libraries. It will be a building for the city, open and accessible. But while it is not done, you can visit the Humboldt Box to check more information about the reconstruction efforts, and go up to have a top view of it all. 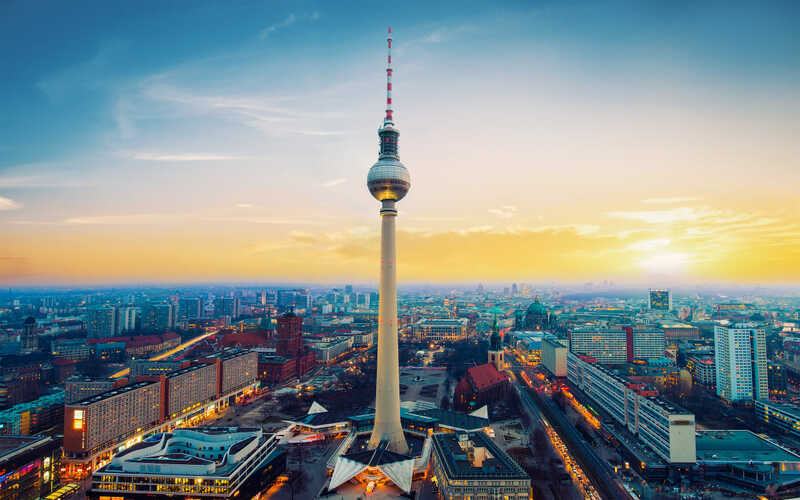 After either marveling at the beauty of the Baroque details of the Palace or gasping at the nonsense of such an undertaking, keep heading east towards Alexanderplatz and the TV Tower, our last stop in the tour. On the way, stop by the DDR Museum (or GDR Museum). In the list of museum-everyone-talks-about-to-which-I-have-never-been, it seems to be a really cool one. 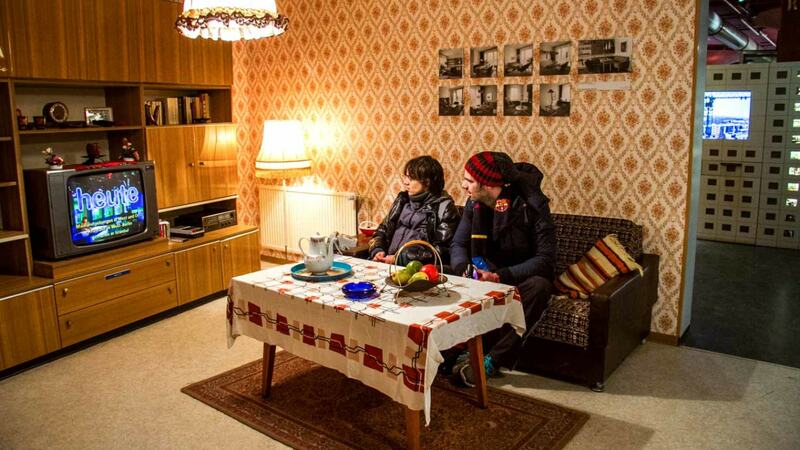 With a hands-on approach, it shows to the visitors how life in East Germany back in the Wall times. You can find it right across the river from the Cathedral. Also, if you are into fish, the AquaDom might be interesting. Not for its Sea Life aquarium, but for the “fish elevator”. 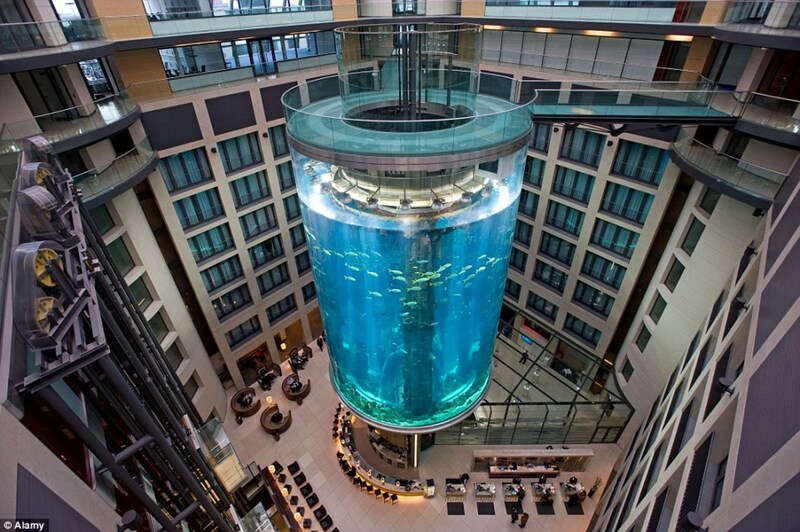 Yeah, it is an elevator inside a fish tank. Or a fish tank around an elevator. Anyway, the thing is a 25-meter tall cylinder with a built-in transparent lift. It is anyway on the way to the TV Tower. So head there and get in the queue. When I first came to Germany, I thought it was quite weird that every city had its TV tower, and that you could go up and visit them. Weird but cool, as I am a sucker for tall stuff you can go up to and see the view below. 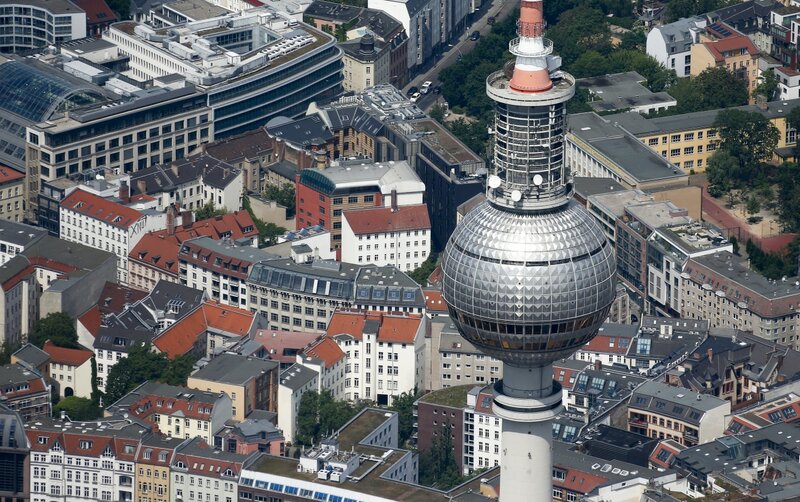 The Berlin TV Tower (Fernsehturm) is one of the most iconic. Many architects were involved in its design, but Hanselmann is the most prominent. The idea was to create something that represented the power of East Germany and Socialism. Positioned strategically, so it was visible from the West, it was also inspired by the Soviet satellite Sputnik, with the adorning red lights symbolizing Socialism. Inaugurated in 1969, the sphere has an observation deck at 203-meter height. 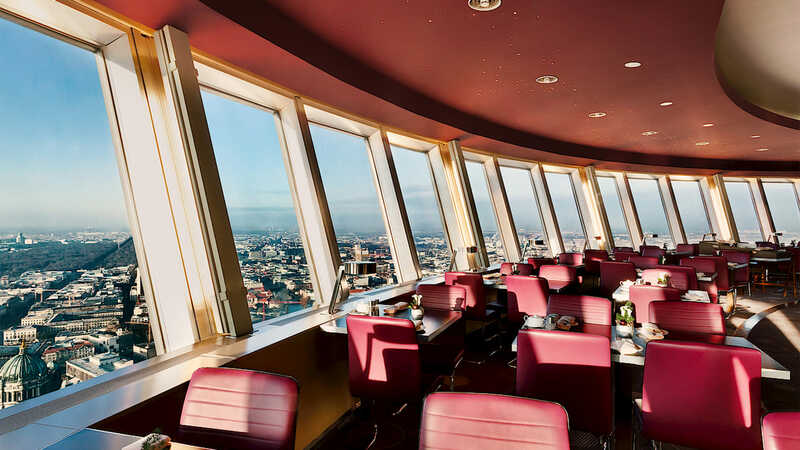 On the level above it, a rotating restaurant gives diners a 360-degree panorama of the city every half an hour. Below, five floors serve as operating floors to broadcast over 60 radio and television programs through the many antennae on top of the tower. It is the symbol of Berlin. Much cooler than the Brandenburg Gate. It is also one of the most popular touristic attractions, so be smart and get your tickets online , or risk wasting hours on lines. But do visit it. 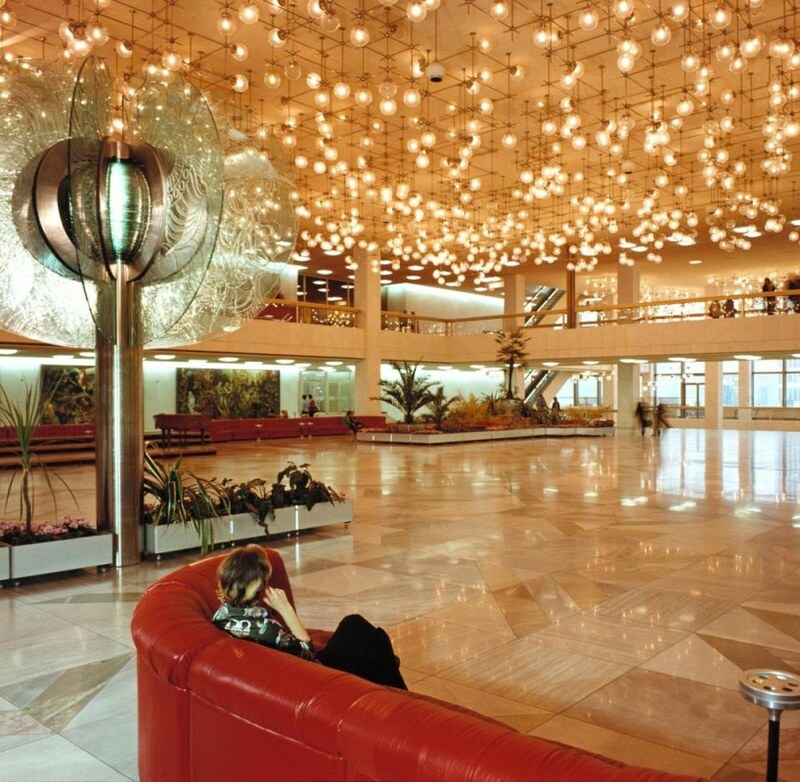 It is a fantastic example of architecture from the GDR and a really cool experience. Alright, this was a short chapter in the Berlin Contemporary Architecture Guide. But it does not end here. We are now in East Berlin, and for the first-timer, it is a fascinating, strange place. After the TV Tower, move over to the Alexanderplatz. It used to be a cattle market just outside the city walls. 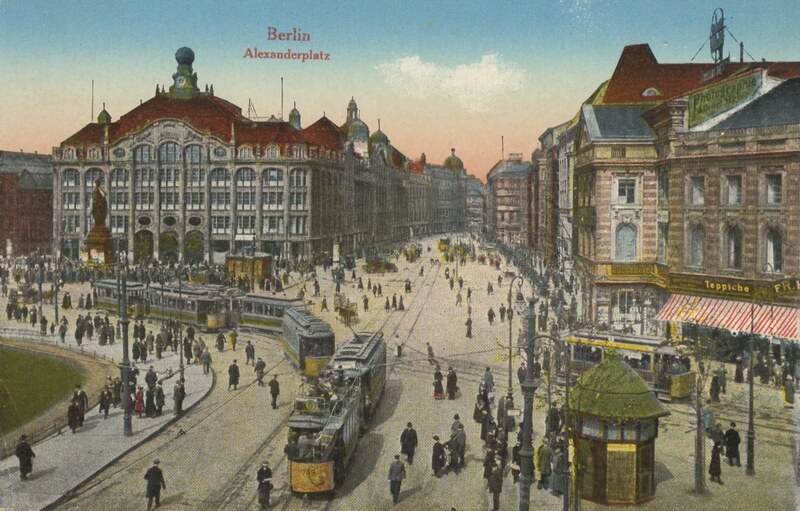 During the 1920s, it rivaled with Potsdamer Platz as the nightlife center of the city. After the War, the GDR brought it back as the center of East Berlin. 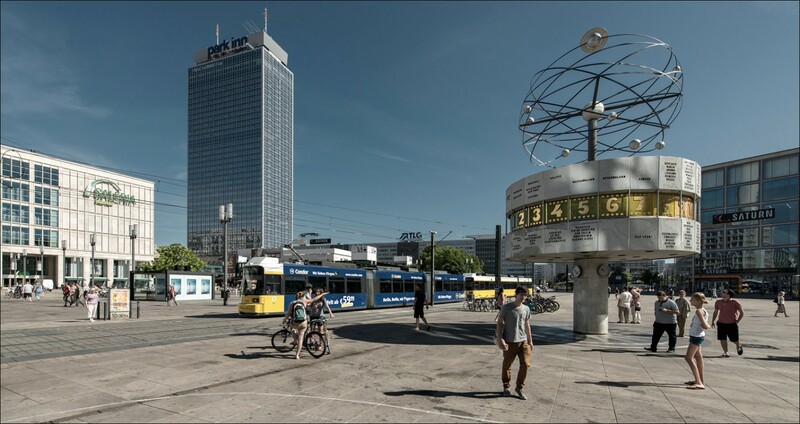 It was pedestrianized, and many new attractions were built which stand until today: the Park Inn Hotel, the TV Tower, the Urania World Clock, the Fountain of the Peoples' Friendship. Since the reunification, a lot of construction went on. A crazy master plan from Hans Kollhoff placed dozens of skyscrapers around the area. Most of it will probably never happen, but a while ago we saw a competition taking place to build the first one: a residential tower by Frank Gehry . But until today, nothing is really happening. Alex (as called by the locals) it is also a fond place for me. The office I work in Berlin is right there, in the former GDR Travel Agency building. I do hope Kollhoff’s plan does not go much further, as our building is set to give way to another shiny skyscraper. It should be enough to have Gehry’s blocking all our West views. From Alex, you can head southeast to Karl-Marx Allee, another super interesting place in Berlin. 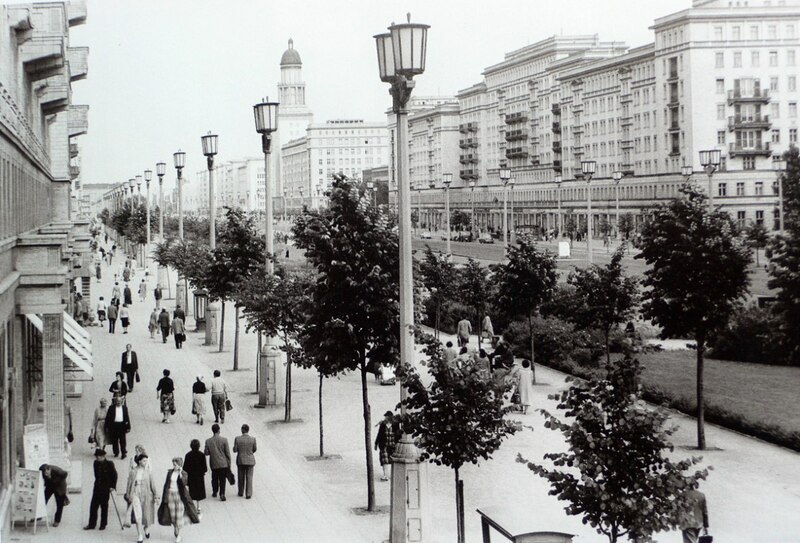 Originally names Stalinallee, it was the flagship project of the GDR during War reconstruction efforts. Many architects too part in the planning of the rows and rows of luxurious apartment blocks lining up the new avenue. The buildings were in a wedding-cake-style typical of the Socialist Classicism of the Soviet Union, clad in ceramic tiles of different pastel colors. Shops, cafes, restaurants, cinemas, hotels placed along the avenue and on the ground floor of the buildings turned the Avenue into a major destination for shopping and leisure in East Berlin. And it looks magnificent, until today. Walking from beginning to the end, from Strausberger Platz all the way to Frankfurter Tor, is an experience. One the way, check out Kino International, a solitary building housing a cinema which always has the coolest hand-painted film posters hanging outside. Cafe Moskau, Kosmetik Salon, Kosmos are other buildings along the avenue worth a look. [gallery type="rectangular" ids="2257,2271"] And once you reach Frankfurter Tor you’ll be right in my neighborhood, Friedrichshain. From there, head south to hang out on Box-Hagener Platz, or walk over to Oberbaumbrucke onto Kreuzberg on the other side of the Spree.